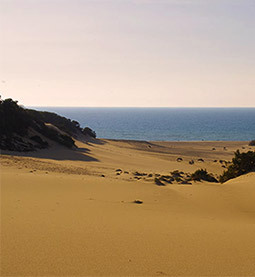 Close to Cagliari - Elmas Airport (50 minutes by car) and approximately 20km from the town (20 minutes by car), the Costa Verde is famous in the whole of Sardinia thanks to its long beaches of golden sand such as Piscinas. The B&B Il Quinto Moro gives you the opportunity to relax in peace and quiet, close to all the area’s captivating attractions. You can be stretched out on golden sands in the morning and exploring the mysterious mountainside in the afternoon - the choice is yours.